Case citation is a system used by legal professionals to identify past court case decisions, either in series of books called reporters or law reports, or in a neutral style that identifies a decision regardless of where it is reported. Case citations are formatted differently in different jurisdictions, but generally contain the same key information. 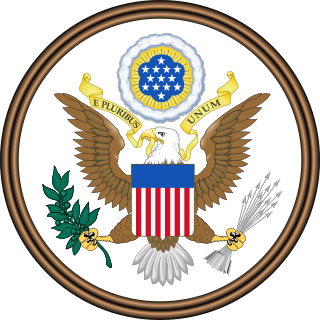 The Judiciary Act of 1789 was a United States federal statute adopted on September 24, 1789, in the first session of the First United States Congress. It established the federal judiciary of the United States. Article III, Section 1 of the Constitution prescribed that the "judicial power of the United States, shall be vested in one supreme Court, and such inferior Courts" as Congress saw fit to establish. It made no provision for the composition or procedures of any of the courts, leaving this to Congress to decide. Berks County is a county located in the U.S. state of Pennsylvania. As of the 2010 census, the population was 411,442. The county seat is Reading. Bucks County is a county located in the Commonwealth of Pennsylvania. As of the 2010 census, the population was 625,249, making it the fourth-most populous county in Pennsylvania and the 99th-most populous county in the United States. The county seat is Doylestown. The county is named after the English county of Buckinghamshire or more precisely, its shortname. Chester County (Chesco) is a county in the U.S. state of Pennsylvania. As of the 2010 census, the population was 498,886, increasing by 4.1% to a census-estimated 519,293 residents as of 2017. The county seat is West Chester. Chester County was one of the three original Pennsylvania counties created by William Penn in 1682. It was named for Chester, England. Juan Ramon Sanchez is the Chief United States District Judge of the United States District Court for the Eastern District of Pennsylvania. William Miller McSwain is the United States Attorney for the United States District Court for the Eastern District of Pennsylvania. The United States District Court for the District of Pennsylvania was one of the original 13 courts established by the Judiciary Act of 1789, 1 Stat. 73, on September 24, 1789. It was subdivided on April 20, 1818, by 3 Stat. 462,   into the Eastern and Western Districts to be headquartered in Philadelphia and Pittsburgh, respectively. Portions of these districts were subsequently subdivided into the Middle District on March 2, 1901, by 31 Stat. 880. At the time of its initial subdivision, presiding judge Richard Peters Jr. was reassigned to only the Eastern District. The United States District Court for the Western District of Pennsylvania sits in Pittsburgh, Erie, and Johnstown, Pennsylvania. It is composed of ten judges as authorized by federal law. Appeals from this court are heard by the United States Court of Appeals for the Third Circuit. The United States District Court for the Middle District of Pennsylvania is a district level federal court with jurisdiction over approximately one half of Pennsylvania. 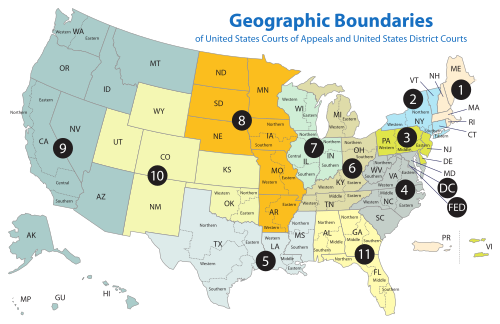 The court was created in 1901 by subdividing the United States District Court for the Eastern District of Pennsylvania and the United States District Court for the Western District of Pennsylvania. The court is under the jurisdiction of the United States Court of Appeals for the Third Circuit. Richard Peters sometimes Richard Peters, Jr., to distinguish from his uncle, though this can also mean his son Richard), was an American lawyer, jurist, and politician from Philadelphia, Pennsylvania. He was a delegate for Pennsylvania to the Continental Congress in 1782 and 1783. For many years he was a United States federal judge for Pennsylvania. 15 Harry Ellis Kalodner PA 1896–1977 1938–1946  — — F. Roosevelt appointment to 3d Cir. 31 A. Leon Higginbotham Jr. PA 1928–1998 1964–1977  — — L. Johnson appointment to 3d Cir. Senior status is a form of semi-retirement for United States federal judges and judges in some state court systems. A judge must be at least 65 years of age and have served in federal courts for at least 15 years to qualify, with one less year of service required for each additional year of age. When that happens, they receive the full salary of a judge but have the option to take a reduced caseload, although many senior judges choose to continue to work full-time. Additionally, senior judges do not occupy seats; instead, their seats become vacant, and the president may appoint new full-time judges to fill their spots. 1 2 3 Asbury Dickens, A Synoptical Index to the Laws and Treaties of the United States of America (1852), p. 388. 1 2 3 U.S. District Courts of Pennsylvania, Legislative history, Federal Judicial Center . ↑ Recess appointment; formally nominated on December 11, 1828, confirmed by the United States Senate on February 23, 1829, and received commission on February 23, 1829. ↑ Recess appointment; formally nominated on January 5, 1939, confirmed by the United States Senate on March 30, 1939, and received commission on May 4, 1939. ↑ Recess appointment; formally nominated on April 4, 1940, confirmed by the United States Senate on April 24, 1940, and received commission on April 29, 1940. ↑ Recess appointment; formally nominated on January 5, 1950, confirmed by the United States Senate on March 8, 1950, and received commission on March 9, 1950. ↑ Recess appointment; formally nominated on January 5, 1950, confirmed by the United States Senate on April 4, 1950, and received commission on April 7, 1950. ↑ Recess appointment; formally nominated on January 12, 1956, confirmed by the United States Senate on March 28, 1956, and received commission on March 29, 1956. 1 2 Recess appointment; formally nominated on February 3, 1964, confirmed by the United States Senate on March 14, 1964, and received commission on March 17, 1964. ↑ "Former U.s. Attorney To Represent Preate Edward Dennis Jr. Was Named As Counsel In The Office Investigation. The Bill Goes To Taxpayers. - philly-archives". articles.philly.com. Retrieved 2015-12-02. ↑ "History of the Federal Judiciary". fjc.gov. Retrieved 2015-12-02. ↑ "Region's U.S. attorney will resign Michael R. Stiles has spent 8 years in the high-profile post. Delco's D.A. is viewed as a possible successor. - philly-archives". articles.philly.com. Retrieved 2015-12-02. ↑ "President Obama nominates Zane Memeger to replace Pat Meehan | lehighvalleylive.com". lehighvalleylive.com. Retrieved 2015-12-02. The United States District Court for the Southern District of New York, known informally as The Mother Court, is a federal district court. Appeals from the Southern District of New York are taken to the United States Court of Appeals for the Second Circuit. The United States District Court for the District of New Jersey is a federal court in the Third Circuit. 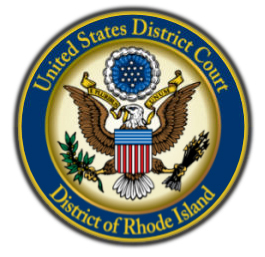 The United States District Court for the District of Rhode Island is the Federal district court whose jurisdiction is the state of Rhode Island. The District Court was created in 1790 when Rhode Island ratified the Constitution. The Federal Courthouse was built in 1908. The United States District Court for the Northern District of Georgia is a United States District Court which serves the residents of forty-six counties. These are divided up into four divisions. 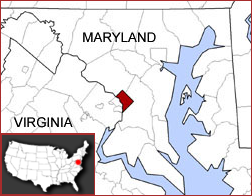 The United States District Court for the District of Columbia is a federal district court. Appeals from the District are taken to the United States Court of Appeals for the District of Columbia Circuit.